DanceNet: Editorials from October, 2009. If you didn't know about the Jordan Frisbee and Tatiana Mollman West Coast Swing workshops in the Boston area this past weekend and would have liked to attended them, you should know that I never knew about them and barely noticed them mentioned in a newsletter from *Connecticut* a few days ago so it was too late to add them to this website (I upload new updates every Sunday). Please talk up this website to the people who run the dance events you attend regularly. Tell them that the listings are free and can potentially reach over 20,000 readers every month. Many visitors go straight to the Boston calendar, even if they live outside of Boston, so there's a large readership base here who might want to show up. Some nice people wrote in to tell me that they found dancing away from Boston because I had it on my Boston calendar during a time when there wasn't any dancing around Boston. Actually, there's a caveat there: the Boston calendar will carry listings for dancing in other areas whenever they have live music and the organizer is also a sponsor of this website. Hartford Swing in West Hartford, Connecticut. Connecticut Swing Dance Society in the New Haven, CT area. I do this because I like live music and I want to encourage more of it, plus the fact that I want to reward non-Boston venues for supporting this website. Note that I don't include Hartford Swing Jam in the Boston calendar because they don't have live music. I've driven to Hartford Swing and Shoreline Swing and they're not that far away. They get out a little earlier and I'm back in Boston by 1:30 am or earlier. In any case, there is a variety of good dancing all over New England that aren't listed in the Boston calendar. When you don't find something you like, check out the dancing in the other nearby states. A couple of friends took me to a restaurant called Temple Bar in Cambridge the other night. At first I thought it was some ethnic (e.g. "Chinese") restaurant but I suppose "American" is ethnic, too. It was pretty upscale, but the interesting thing is that I asked if they made a tiramisu martini, something only found at Bertucci's. To my surprise, the manager showed up at my table with the drink after being curious about it and looking it up on the Internet. What was even nicer is that he showed up with a second drink on the house after talking to us about how it tasted. Good friends, good food, good ambiance, and unquestionably good service. What a pleasant dining experience. I'm pretty sure I've expressed some opinions about how to buy computers and I wanted to amend some of them. For desktop PC's, I've suggested that $100-$125 is the "sweet spot" for a computer's microprocessor. More than that and you're probably overspending unless you're trying for something really fast right away. That kind of stuff. However, for a laptop, I wanted to modify that. Once you get a laptop, you're pretty much stuck with it. You're not going to buy a bigger monitor for it; you're not going to get a faster CPU for it. Even increasing the amount of RAM is problematic; if the laptop comes with both RAM sockets filled, you're going to have to throw away some of the existing RAM to add more memory. Don't get the basic processor. You're going to be stuck with whatever you order so get as fast a processor that you can afford. See if you can't get something better than what you planned for. Most, if not all, laptops have two memory sockets. Make sure one of them is free for expansion. For instance, if you get 1GB of RAM with your laptop, get *1* stick of 1GB RAM instead of two 514MB RAM modules. If you get your laptop with two modules of any amount of RAM, you're going to have to throw away one of them in order to expand your laptop's memory. If given a choice of two power supplies for your laptop, buy the more powerful one. I got the basic 60W one for my laptop. I'm suppose to be able to use the same power supply to power the docking station I got for my laptop. However, that same 60W power supply isn't strong enough to power *both* my laptop and my docking station. Don't buy the "Home" version of any Windows operating system. Get the "Professional" one, the same one that companies order with their laptops. The Professional version will be supported for many more years than the Home version. Support for Windows XP Home was discontinued a couple of years ago; XP Professional will be supported by Microsoft (with patches and fixes) for another 4 years. You're going to be stuck with the laptop you buy for many years. If you choose to be "cheap" now, you're going to regret it later on. My Dell Lattitude D630 (from last year) with its T8300 (2.4GHz) processor and 2GB of RAM feels alot faster than a newer Dell Inspiron Studio 17 with a T6500 (2.1GHz) and 3GB of RAM. PS: Changing the hard drive is easy. The first thing I did when I bought my laptop is replace the 80GB hard drive with a 320GB drive. Just buy a laptop that comes with "restoration" CD's. I'm continuing to get encouragement from people who tell me I *should* find a way to make money off this website. This is coming from dancers and the dance organizers. One suggestion was to have subscriptions, to have the readers subscribe to this website. Personally, I think people are cheap and won't want to pay for something that used to be free, especially where the information is available elsewhere. Plus, people are cheap. The obvious source of income is the dance teachers and organizers; after all, I'm sending them paying customers. I would imagine that some teachers don't value this website as much as others and would withdraw their listings. That, of course, would diminish the value of this website if it didn't have everyone in it. Plus, many of those people are cheap, too. The sponsors, well, that's a different story. Those are the people who *most* value their listings on this website because it's pretty much an exclusive club, people who get the personal endorsement of the website and extra visibility on a website that gets 20,000-25,000 different visitors a month. There are a few people who want to get on that list and they might. I must admit that I'm troubled when confronted with the idea of getting sponsors from the tango side of this website. There aren't that many tango dance teachers and promoters and the list of sponsors would probably include half the existing venues and piss off the other half. On the other hand, I've never even met most of them even though I've been running the Tango website for over 10 years now. Keep them ideas coming in. I'm always willing to listen to new ideas and I might even find one of them worth trying out. It is with great sadness that I bring you news that local dancer Lou Laudani passed away on Wednesday, October 21. I got the news from his kids. Lou was 79. Lou was a good experienced dancer who shared with me his secrets of surviving songs that were either too fast or too long, way before I ever heard of Balboa. I remember when he used to do aerials with Marie Lawlor and this was when he was in his 60s. There's a clip of Lou dancing with Marie Lawlor (Thanks to Roger Weiss). He attended Phillips Academy. He served in Korea and protested the Vietnam War. He ran for the US House of Representives in 1982 against James Shannon as a Libertarian and got 17% of the vote. He had a well-deserved reputation as a curmudgeon. He retired early from his profession as a dentist so he'd have a chance to enjoy the rest of his life. The title of his retirement party was "The No More Alimony Party". I'd like to thank everyone who gave rides to Lou to and from dances recently. He had given up driving because his vision had deteriorated, but his love of dancing never diminished. We last saw him two weeks earlier at an IC dance. There will be a wake for Lou on Monday, October 26, from 4:00 to 8:00 pm at the Douglas Funeral Home, 51 Worthen Road in Lexington. I'll post information about the funeral as soon as I get it. 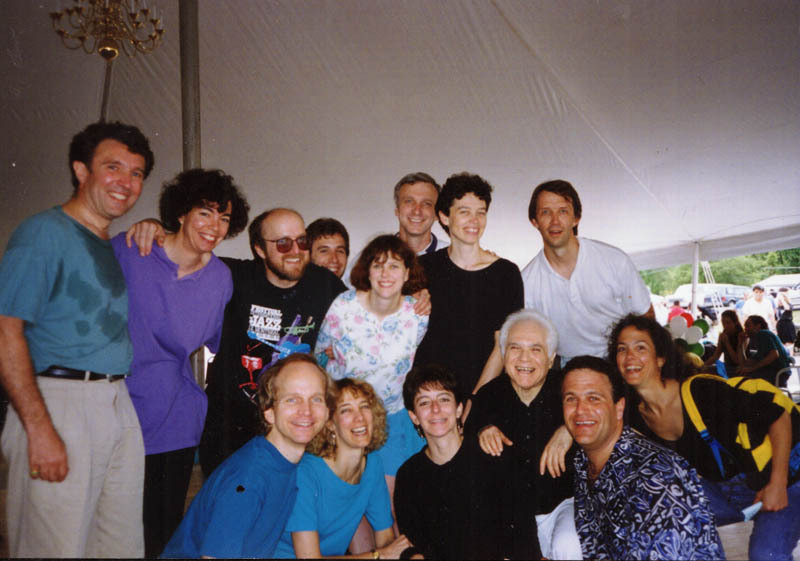 Lou and friends at Boogie in the Mountain dance camp (circa 1993?). Thanks to Lou's daughter, Nora, for the picture. As I type this, I got a note from former Bostonian Michael Restivo. Mike lives in Michigan now and was a former director of the Boston Swing Dance Society. He met his wife Michelle on the dance floor during Thursday swing dancing at the Veronique Restaurant 15 years ago. "Thank you for your email. I'm really sorry to hear about Lou passing away. I have fond memories of many dances, parties and get-togethers chatting with him. He spread a lot of happiness in his time. I'm glad to have shared some of it with him on and near the dance floor. I'll also never forget him sharing the family secret to longevity: seven cloves of garlic a day." "I can think of so many times of "hanging" with Lou. Benson, you wrote a great piece that really captured his spirit. He was such a funny old guy long before he was even old. He once told me all about how he had avoided heart surgery and...then quite a few years later was forced to have it. I think he was pretty happy with his big party a few years back. So sad. Quite an extraordinary guy is gone."